She never changes her facial expression... as always?. Kristen Stewart with the same facial expression at all four movie premieres. Wallpaper and background images in the Harry Potter vs Twilight club tagged: twilight kristen stewart new moon eclipse breaknig dawn emotion facial expression movie. This Harry Potter vs Twilight fan art contains portrait, headshot, gros plan, closeup, anime, bande dessinée, manga, and dessin animé. This one gave me mixed emotions, ultimately leaving me confused, so I had to share. I think they were spoofing the idiots who say that she never changes her facial expression because they say she's frowning all of the time. 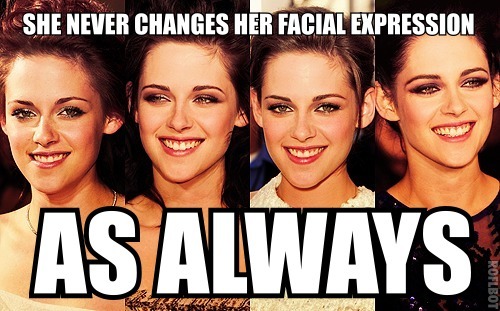 Or it could just be another hater who's saying that even all of her smiles are the same. Who knows. It could go either way. Looking at this person's page, I couldn't tell. lol I completely overlooked the credit. Yeah, so hard to tell how that person meant it to come across. I'm guessing what Vamp said, that it's a spoof. Pretty sure hate tumblrs are against the rules, maybe. I think it's just the same old haters that say she doesn't smile realized she smiles, so decided to say she always has the same smile instead, just to find something bad to say about her. very,very narrow minded.Really,people,complain about something better.These are the kind of haters who give a bad name to everyone else.